in major cities within South Korea you can pay your bus and subway ride via an option put into credit cards and cell phones . 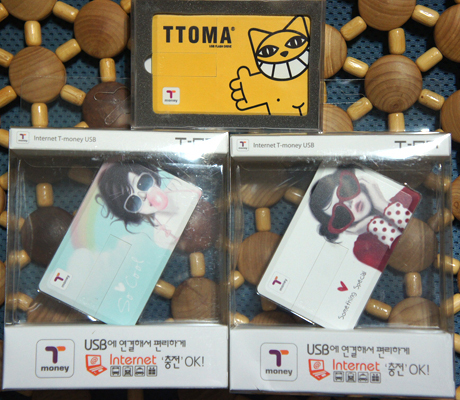 then since March 2007 a new payment method for daily transportation called T-Money has been serviced by Korea Smart Card . its use has been spreading steadily in a rather slow pace but I mention it now for if you hail a taxi today chances are they will have the extra payment machine installed . basically it is a pre-paid card for use in subway, bus and roughly 70% of taxis carry the machine now . aside from transportation you can use it in tunnel toll fees, parking space run by the City, some museums, Kyobo Bookstore, Jamsil Lotte World amusement park ..
plus a myriad of smaller institutions including convenience stores (GS25, Family Mart, BuyTheWay, MiniStop and 7-11), telephone box, drink dispensers, PC Rooms ..
as of July 2008 usable in Metropolitan Seoul area (which includes surrounding satellite cites), Incheon, WonJu, Asan, CheonAn, PoHang, AnDong, GeoJae, JeJu and is increasing . the fun part is that aside from using basic cards, some can double as USB memory, some as SD memory card adaptors for your computer, as key chains, as photo pendants and as a bracelet ! you can purchase the cards at any subway stations and selective convenience stores while USB-types have to be ordered on-line . but again this is i.T. nation : Korea so some cell phones come with this built-in . or most of the convenience stores mentioned above .